I just finished reading my second book this month, Brian Tracy's, No Excuses. Mr. Tracy, a legend in the field of success, recommends that a person spend two hours a day on personal development. He describes PD as reading, listening to an audio program, or watching video on topics that will make you better at what you do or want to do. If you're in sales, for example, then you should be improving your sales abilities by learning from great salesmen/saleswomen who have already learned what you still have yet to. Self-discipline and self-control (themes throughout the book) are the keys to take yourself to the next level. Most Americans lack the self-discipline it takes to commit to completing difficult tasks, goals, etc. And self-control, which includes an ability to manage yourself because as Mr. Tracy says, you cannot manage time, is just as important. Those two hours a day may as well be 12 hours a day for the average person. There is so much distraction in our country these days, that getting even a 30-minute, uninterrupted reading session, requires incredible personal focus. 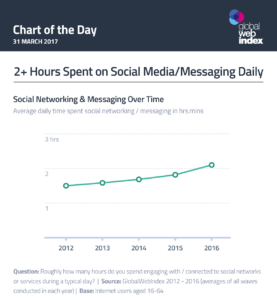 According Blog.globalwebindex.net, people are now spending over two hours a day on social media! And time spent on social media platforms is increasing yearly. Before the weekend began, our President made some headlines again. When isn't he, right? Well, his comments on professional athletes pretty much vanquished thousands of hours of productivity for our country. Thousands of people flocked to Twitter, Facebook, and LinkedIn to read or post their opinions on athletes kneeling during our National Anthem. Now, I'm not here to express my own opinion on this issue. I made a mistake on Facebook, posting one message and it cost me at least a half hour of my life. I learned my lesson. Are you regretting your own involvement on social media this weekend? Take the time to reflect right now if you have yet to consider how financially fruitful your engagements were with other people who follow you or who you follow online. Did any of your individual comments lead you to making a single coin or future coin for that matter? I have an entire chapter on my recently published success book for teens (see left sidebar) that I devote to what I call, "Noise." Noise is anything in the media, news, etc. that has the potential to hijack our emotions and our attention from our self-development. I claim that tuning into "noise" will keep one ignorant. It's true! Is there any redeeming aspect of being part of ongoing political stupidity and drama? Do you feel accomplished or productive after telling everyone your position on an issue for an hour each day? There's no end to the material one can comment on. Americans are sad, sad, people. For how can we be a happy people without each person feeling like they completed something meaningful for themselves each day, and not solely for their employer? The highlight of one's day cannot be whether or not you made your point excellently on someone's thread. Or whether you won the exchange against your liberal or conservative friend. Realize that I'm not saying staying informed is pointless. Of course staying informed is important. What I AM saying is that obsessing about political matters is useless and a complete waste of time. It means you truly have nothing better to do with your life. As Mr. Tracy says, "The quality of your thinking determines the quality of your life." I've read in many places online that racial division is our greatest problem. No my friends, racial division isn't our greatest problem. It's actually our greatest opportunity. Our biggest problem is a lack of a unified vision. America lacks a vision. You too lack a personal vision. And this is why we will all go nowhere and everywhere, and simply stay put. Right where our enemies want us.